Hello and welcome to Saturday! Hope you have had a lovely week! It's time for my post at Creative Expressions. But first, if you are here looking for the current BLOG-HOP with Stampendous and House-Mouse, click HERE to go directly there to play and enter for your chance to WIN BIG!! This was a quick card to make. Its quote shimmery and sparkly IRL too. I love how the Anniversary word shows through the DP. The words is multi layered for dimension and all of the elements were sprayed with GOLD Glitter Spray to create a sparkly, uniformed finished look. 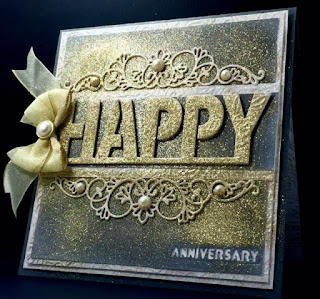 Accessories: Krylon GOLD Glitter Blast Golden Glow Spray, Gold edges Ribbon, Gold and Pearl Brda, Half-pearls, CE/SW Bed or Roses Embossing Folder, and these Creative Expressions Craft Dies by Sue Wilson; Configurations Fanciful Trim and Perspectives Happy. 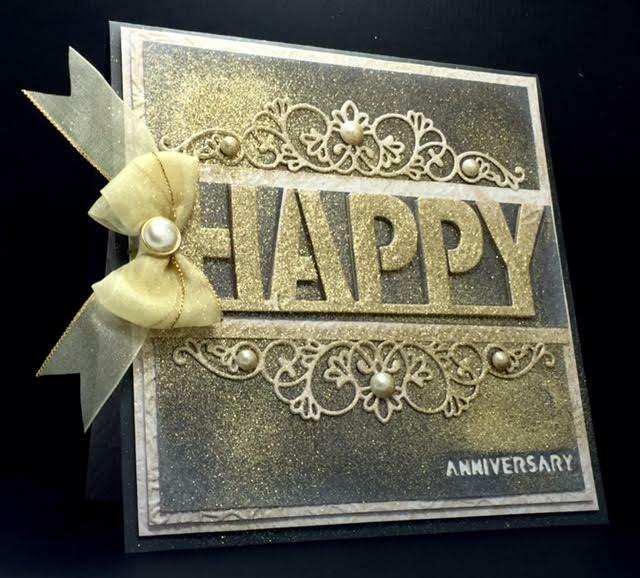 For lots more inspiration, be sure to stop by the Creative Expressions BLOG to check out what the rest of the Design Team has created for you to see, HERE. Check-out this great new FACEBOOK GROUP that Ive created for SW Fans to be inspired. Come share and learn tips, ideas and where to find these CE products ! I love this Card, great colouring.